Would Yoda Survive in Corporate America? Home/Hahndo/Would Yoda Survive in Corporate America? Imagine your boss hired Yoda as a consultant and sent him to you to help execute on your 2016 key initiatives. 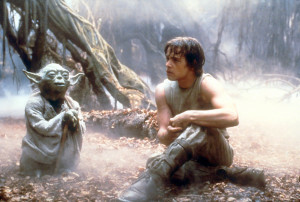 “Alright Yoda, senior leadership says you have alot of wisdom and you’ll be able to help me make some tough decisions. “Ok, sure. I get it, so what should we DO next? “Huh, the force? I thought you were going to provide some great insight. “That is why you fail.” Yoda shakes his head in disapproval. “Fear is the path to the dark side. Fear leads to anger. “You are so right, I’ve made that mistake before trying to… I mean DOING it all myself, running into brick walls and ending up exhausted. This time, I’ll communicate it far and wide, and I’ll start with our management team during today’s meeting!